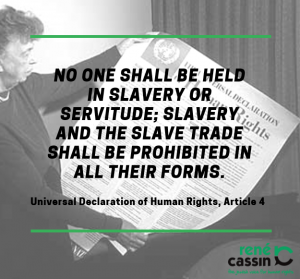 René Cassin » Our Biggest Human Rights Shabbat to Date! René Cassin // Campaigns // Slavery and Trafficking // Our Biggest Human Rights Shabbat to Date! Saturday 10 December 2016 saw over 40 Jewish communities – including one in Barcelona – mark and celebrate Human Rights Shabbat. This was a record amount of communities coming together to talk about the Jewish connection to human rights and learn more about modern day slavery. If you didn’t get a chance to see our resources of factsheets, posters, Jewish text studies and education sessions for different age groups have a look here. “The Human Rights Shabbat Resource Pack by René Cassin is both informative and insightful. It teaches its readers the facts of modern slavery – through case studies, factsheets and educational programmes – while also inspiring individuals to get involved and make a difference. Modern slavery is an evil encroaching on modern society. It impacts millions around the world and thousands in the UK, and I am pleased to see faith groups taking admirable action against this gross injustice. Kevin Hyland OBE, UK Anti-Slavery Commissioner. Have a read of the Jewish News coverage here. You can read Rabbi Aaron Goldstein’s sermon here and listen to him talking about human rights Shabbat on the radio for the last four minutes of this show here. You can read Rabbi Esther Hugenholtz’s sermon here. You can read Danny Friedman QC’s sermon here. You can have a look at Rabbi Mark Goldsmith’s text study here. You can read our director’s, Mia Hasenson-Gross’s thoughts in this blog for Masorti Judaism here. Thank you to everyone who marked the Shabbat. We are working on modern day slavery all year round and would love you to get involved with our work. Don’t hesitate to get in touch or read more here.